Nikon D800 promotional photo leaked? Nikon D800: officially revealed on 7 February? Another day, another Nikon D800 rumour… or a tantalising glimpse at an alleged picture of the D700 replacement, at any rate. NikonRumors has published this low contrast, slightly distorted shot of what could potentially be the D800. It's hard to tell, as the picture appears to be of an image being displayed on a projector screen that's been hastily snapped using a mobile phone. Rumours are circulating that Nikon's new full-frame DSLR will be confirmed on February 7th, to coincide with the CP+ photography show in Japan. The D700's successor is expected to feature a 36MP FX CMOS sensor, offering three times the resolution of the current camera. Landscape and studio photographers might relish this generous bump in resolution, but the associated increase in file size has implications for both write times (slower) and storage (more required). Dual memory card slots would go some way to help alleviate some of these concerns, but rather than using two CompactFlash slots, can we expect the D800 to opt for an XQD and CF card combination, as in the Nikon D4? Launched in January, XQD cards have the potential to deliver ultra-fast data transfer speeds, so using them would make sense when dealing with such high resolution images and movie files. And the D800 is likely to be all about the movies. We anticipate that the D800 will mirror the D4's drive towards beefed-up video performance and this latest image shows an external microphone attached to the camera's hotshoe. 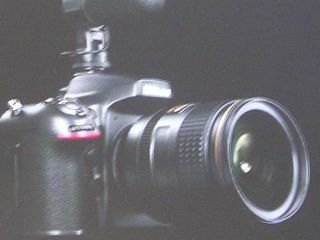 A purported image of the D800 released in 2011 indicated a direct movie record button next to the shutter release (see below) and a new Live View movie/stills switch on the rear of the camera. Both of these feature on the Nikon D4, adding credibility to these earlier pictures.